This post will piggyback on one of my previous posts – You Do You. I felt rushed and I was unable to articulate my thoughts accurately at the time, so this post will be a clearer, more elaborate post. My inspiration this time around was actually from a picture I found on Flickr, with a very profound quote which I felt I could analyze and view from my own life’s point of view. 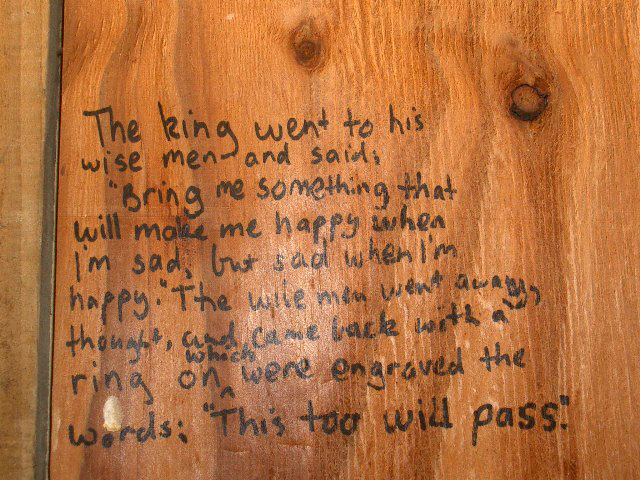 “This too shall pass.” This quote, somehow so simple yet complex, exemplifies the duality of life. No matter what situation you are in, this quote inevitably describes life’s next step: up or down. Like a sin graph, the lives of most are never stagnant or constant, but always fluctuating or undulating. And that is the most perplexing, equivocal part of life. Throughout my life, but especially since high school has started, I have had rapid waves of climbing and falling. The frequency often ranges from during a week to even during a day. I am put in a situations which give me a natural high – being able to enjoy my time with great people and friends, finding myself in the zone in any circumstance, or simply just appreciating events unfolding – and I become elated. However, life unravels and other unfortunate events – being burdened with work or responsibilities, conflicts, the regular stresses of life – pull me down into a state of melancholy or ennui. Yet, remembering that “this too shall pass” brings a balance to my seemingly bipolar swings. Like the king, the exhilaration I experience is put into perspective: my mindset is brought from its idealism to comforting optimism, for the next situation may hit hard, unless my gloves are on and my arms squared up. Yet, my everyday pessimism is also reassured: the unfortunate position I find myself at that point in time is solely a steep slope towards my life’s next peak. It is in these four words which I find my depression and anxiety, my peace of mind and my contentment. Maybe I should just do me, for like I said before, it is making the first decision which is important, as life’s hills and valleys are inevitable. Yet, now I feel that life is about appreciating the present, but always looking ahead, considering the future, the great unknown of tomorrow, for this, too, shall pass.